Washington: Donald Trump and Kim Jong-un are to hold their second summit in Vietnam at the end of February, the US president has confirmed. And he repeated an earlier claim to have averted a major conflict due to his Korean diplomacy - a mixture of engagement, economic sanctions and threats of military action. Since his first meeting with Kim in Singapore last June, Trump said “our hostages have come home, nuclear testing has stopped, and there has not been a missile launch in more than 15 months”. The president did not name a precise venue. According to CNN, the two cities under consideration are Hanoi and Da Nang. Reuters reported that four US military V-22 Osprey aircraft had arrived at Da Nang airport from the southern Japanese island of Okinawa on Tuesday evening and left a few hours later. South Korea, which has seen an improvement in ties with North Korea under its liberal president, Moon Jae-in, welcomed Trump’s announcement. “The two leaders already took their first step in Singapore toward shaking off their 70-year history of hostilities. Now we hope that they will take a step forward for concrete, substantive progress,” said Kim Eui-kyeom, the presidential spokesman. Japan said it hoped the summit would be “meaningful” and lead to the complete denuclearisation of the Korean peninsula. On the same Asian trip, Trump is also expected to meet China’s president, Xi Jinping, in the hope of finalising a trade deal before the March 1 deadline imposed by both countries for resolving an array of disputes that have threatened to trigger a trade war. The US special envoy for North Korea, Stephen Biegun, is in North Korea this week to continue planning the second Trump-Kim summit, in the hope of guaranteeing a substantive outcome. Since Trump and Kim met in their historic first encounter in Singapore, North Korea has not carried out any nuclear or missile tests, and it released US nationals it was holding. For its part, the US has not taken part in major joint exercises with its South Korean allies. 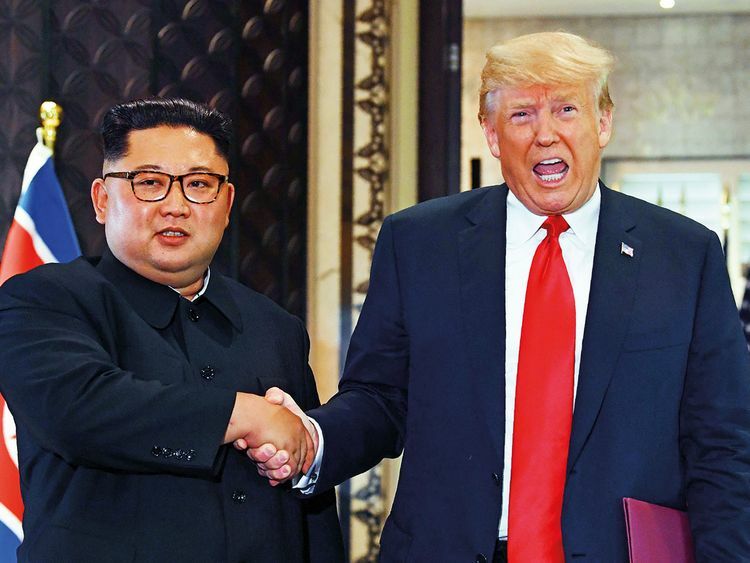 But the North Korean nuclear disarmament that Trump and his secretary of state, Mike Pompeo, claimed would follow the Singapore summit, has not materialised. UN officials told CNN on the day of Trump’s state of the union speech that a confidential report concluded that the Kim regime was dispersing and hiding its assembly, storage and testing facilities for its nuclear and ballistic programmes. Last week, the US director of national intelligence, Daniel Coats, presented a report to Congress that said that Pyongyang was “unlikely to give up” its nuclear weapons because its leadership sees them as “critical to regime survival”. Trump has rejected those sceptical assessments and insisted “tremendous progress” has been made out of the view of the world’s media.